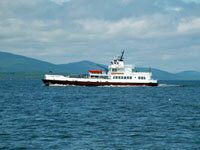 Private and state-run ferry services provide a vital link to Maineâ€™s many island communities. International ferries provide service to Canada from ports in Bar Harbor, Eastport and Portland. There are over 4,600 islands off the coast of Maine not to mention some inland too. 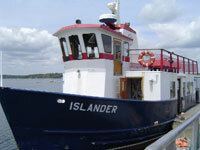 The islands listed on this site are those that are serviced by ferry. Select the link below to learn more about these islands. Select an island below to view ferry services by island. Select a region from the tabs below to view ferry service options in that region. Owned and operated by the Casco Bay Island Transit District, provides public fixed-route ferry service from Portland to six islands in Casco Bay. Casco Bay Lines operates seven days a week, 365 days a year. 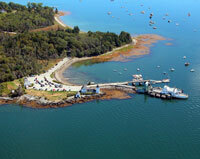 The Chebeauge Transportation Company operates a ferry between Great Chebeague Island in Casco Bay and Cousins Island. Cousins Island is connected to mainland Yarmouth, Maine by a bridge. The ferry takes about 15 minutes each way. 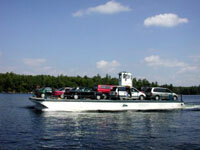 The Frye Island Ferry provides seasonal service to the residents of Frye Island in Sebago Lake. Mainland access to the ferry is from Raymond Neck, in Raymond, Maine. The ferry typically operates between June and September. Get away from it all and experience a Monhegan Day Trip with Balmy Days Cruises! Monhegan Island is a unique and beautiful island 12 miles off the coast of Maine. Hardy Boat Cruises is a small, eco-tourism business lovingly cared for and operated by a local family. The ferry "Margaret Chase Smith" serves Islesboro Island from the town of Lincolnville. Operated by the Maine Department of Transportation, provides fixed-route ferry service from Bass Harbor to Swan's Island and Frenchboro, from Rockland to North Haven and Matinicus Island, and from Lincolnville to Islesboro. 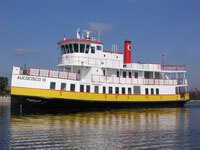 The Ferry Service operates year round. Water taxi service for Matinicus, North Haven, and Rockland, Maine. Also offering puffin trips to Matinicus Rock. The ferry "North Haven" serves Matinicus Island from Rockland. The crossing distance is 23 miles and takes 2 hours and 15 minutes. The Original Monhegan Mailboat Experience transporting you through the waters of beautiful Muscongus Bay and enchanting Monhegan Island. 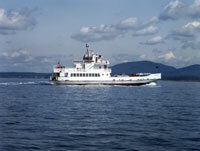 The ferry “Captain Neal Burgess” of the Maine State Ferry Service serves North Haven Island from the City of Rockland. The ferrys "Captain Charles Philbrook" and "Governor Curtis" serve the Vinalhaven Island from the city of Rockland.